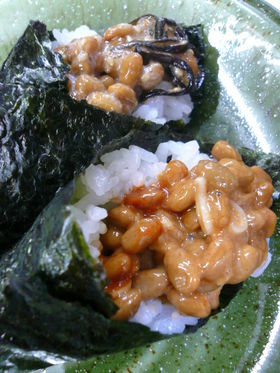 Te-Maki Zushi/手巻き寿司, Hand-rolled sushi or more appropriately said “Cone Sushi). 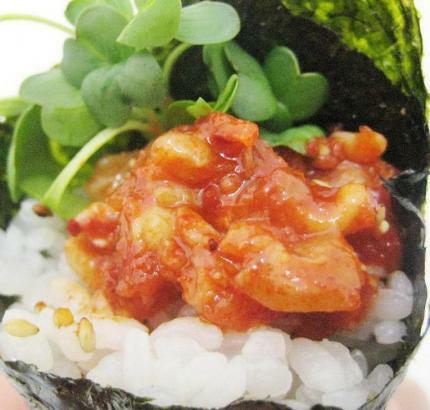 like Te-mari sushi that I introduced yeaterady, are the perfect way of making your own sushi at great informal sushi parties! 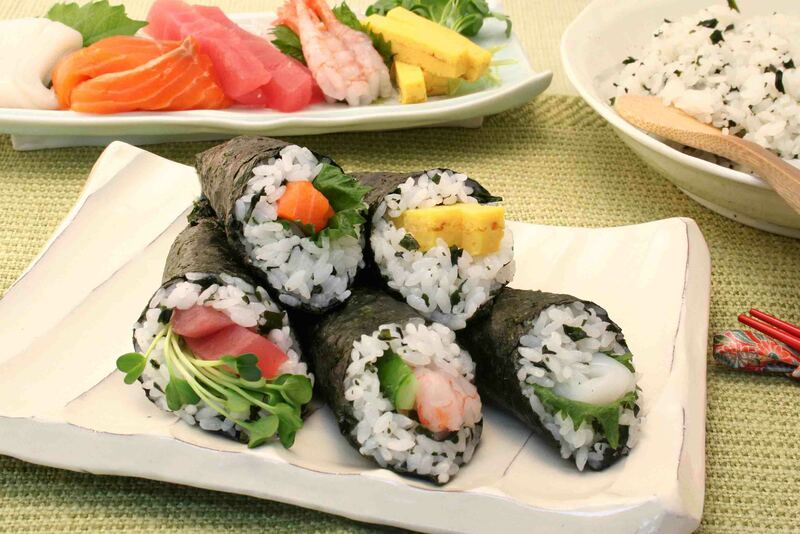 Now, if you decide to organize a Te-Maki Sushi Party, make sure that you have plenty of “neta”/fillings ready for your guests to easily choose from. Bear in ind the priorities of your guests. 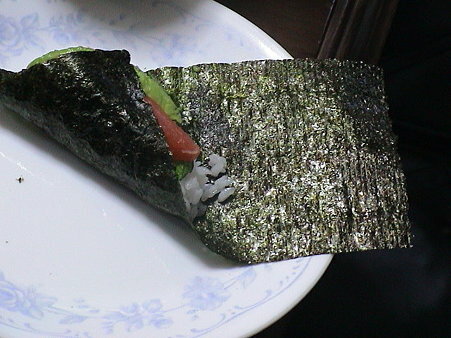 Vegan and vegatarian sushi are very easy to provide for. If need be prepare different plates of ingredients. 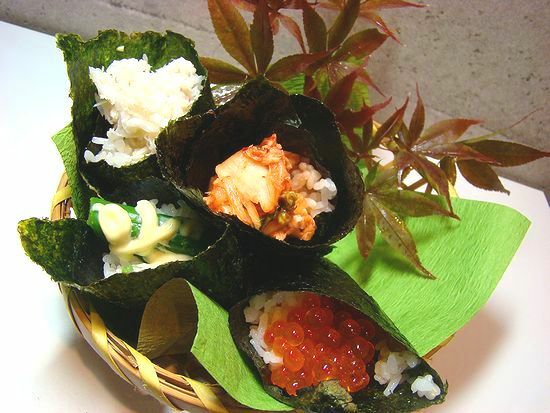 Next you need nori/海苔/ dried sheets of seaweed. 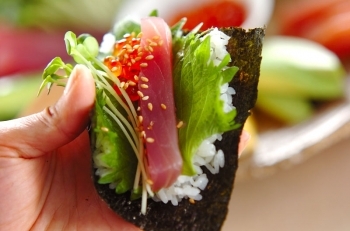 Cut to the size most appropriate to your te-maki. keep in mind the appetite of ypur guests. Some might want them small, others large. Do experiment! 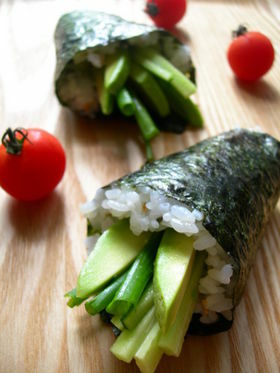 Prepare enough sushi rice for all to fill their te-maki with. One seasoned with sesame seeds like the Missus does all the time, one plain, and another one seasoned with an ingredient of your choice: finely chopped pickle, chopped cooked shiitake, and so on. 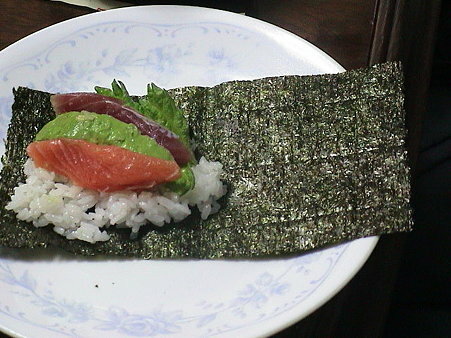 The above te-maki includes three ingredients: avocado, katsuo/bonito and fresh salmon sashimi. 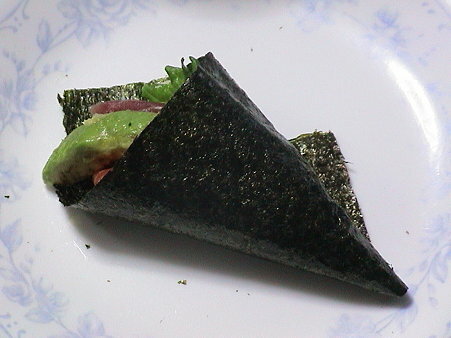 Spread a triangle of sushi rice on the left half of the nori/dry seaweed. The seaweed sheets ought to be cut in half along their length first. 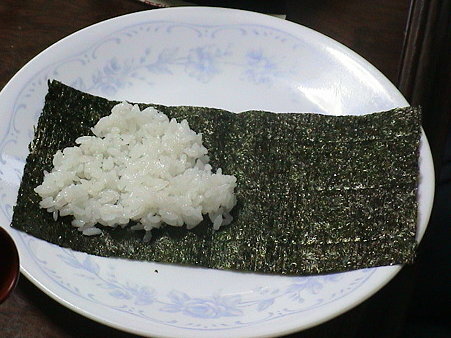 Place the ingredients over the rice as shown in picture. Start rolling from the left. Keep turning until you have completed the cone! 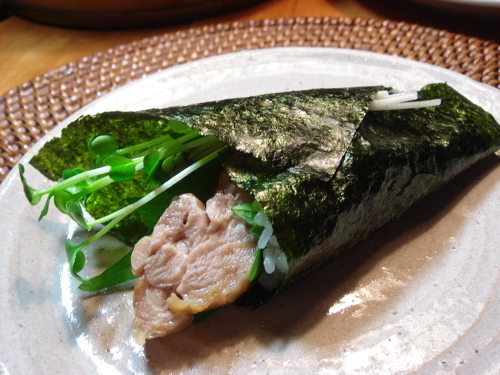 Hera is a group of four different te-maki as a combination suggestion with ingredients that should please both Japanese and non-Japanese. 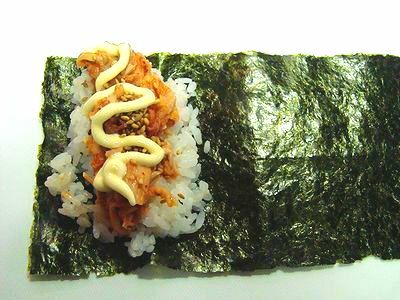 Kimchi, tuna flakes, mayonnaise and sesame seeds! 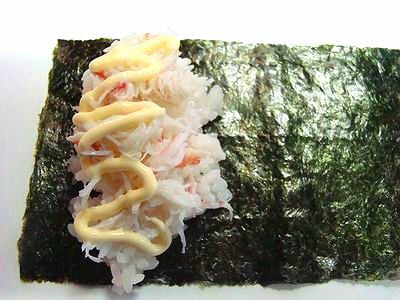 Crab meat and mayonnaise. 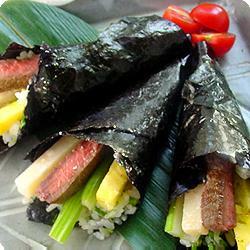 You could add some green leaf vegetables, too! 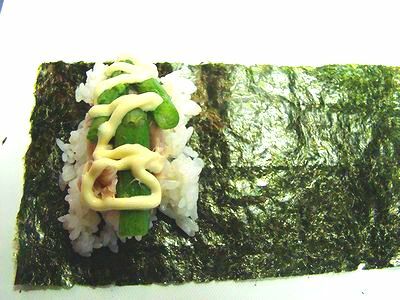 Asparaguses (boiled), tuna flakes and mayonnaise. You could include some curry powder in the mayonnaise! 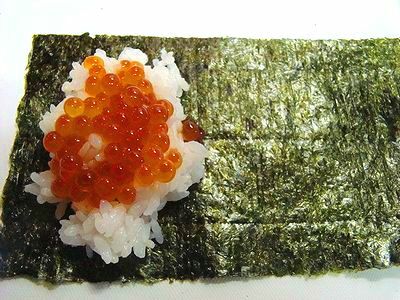 Salmon roe. Season the roe with a little soy sauce first! 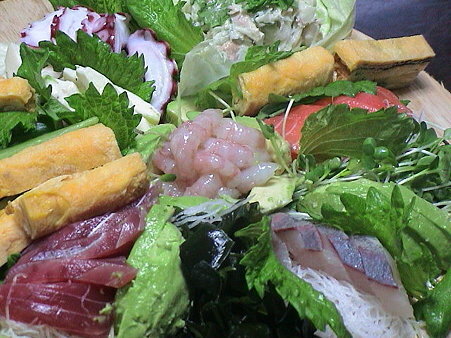 Some wasabi would be welcome, too! Chili sauce shrimps and kawaire daikon sprouts. Tuna, shiso and ikura/salmon roe. Roast beef, omelette and vegetables! 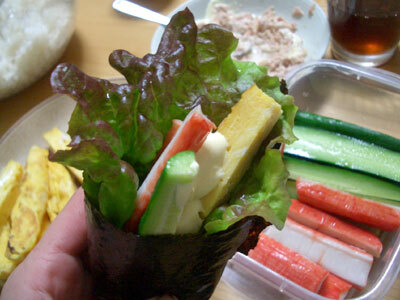 Lettuce, surimi, omelette and cucumber. Fried pork, shiso and kawaire daikon sprouts. 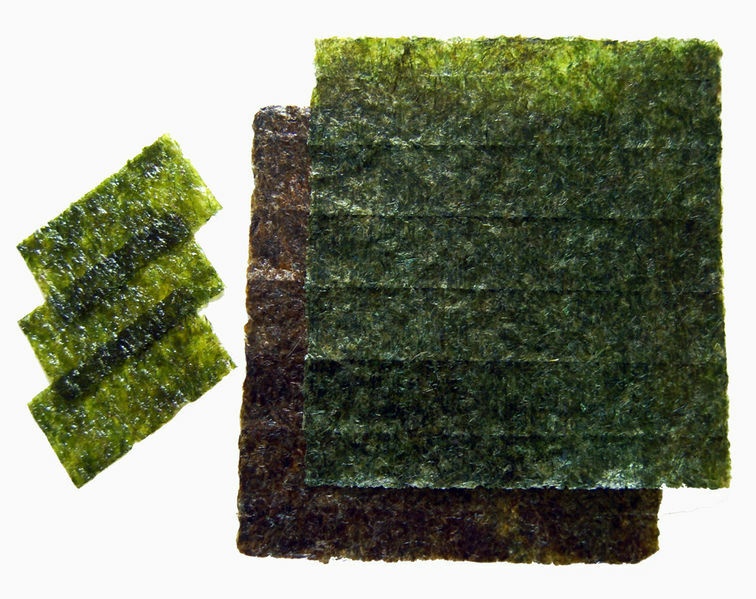 Nato and hijiki seaweed for vegans!